The 2016 race to the White House might seem like it's already zooming full speed ahead, but in terms of dollar signs, it's only just begun. Speaking at Advertising Week, FiveThirtyEight founder and election data pundit Nate Silver said candidates have only spent around $20 million to $30 million on ad buys so far. Even The Wall Street Journal's high-side estimate of $47 million would represent less than 1 percent of the combined $5.5 billion candidates are projected to spend on TV and digital advertising this campaign cycle. Silver, best known for predicting the 2008 presidential election results with stellar accuracy, said it's generally strategic to wait until the latter part of an election cycle before dumping campaign cash on media buys. "There is some evidence that advertising in politics has a pretty short shelf life, so if you saw a Chris Christie ad today and a pollster polls him tomorrow, you might happen to recall Chris Christie's name," Silver said. "If a pollster calls you in two weeks, then it kind of gets very blurry again. It's not so top of mind." Candidates are just now revving up their TV ad buys, with campaigns expected to reach record highs. Political TV ad spending alone is expected to be around $4.4 billion this cycle, according to ad tracking firm Kantar Media. According to a recent report from Borrell Associates, total digital ad spending is expected to be around $1.1 billion. The Wall Street Journal's estimate of $47 million in ad spending so far is three times larger than the total was at this point in the previous presidential campaign. And you can expect to see it all ramping up further very soon. 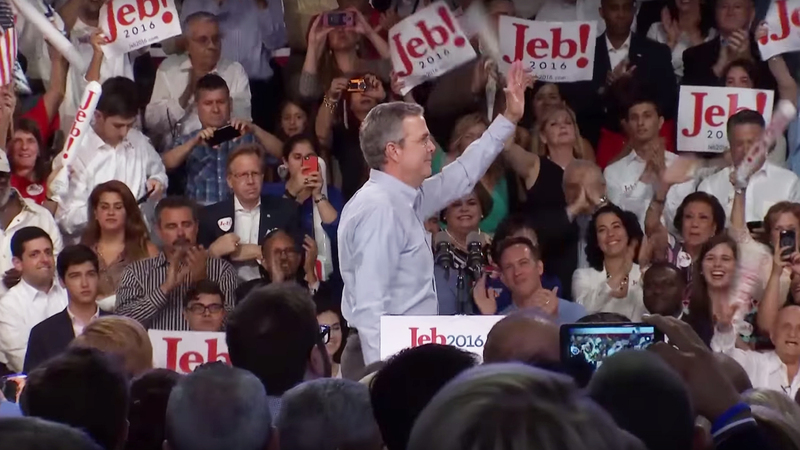 This week, Republican presidential candidate Jeb Bush's campaign said it's reserving $7.8 million for TV spots in January and February in Iowa, New Hampshire and South Carolina. Other candidates' campaigns have started buying as well. So far, Marco Rubio for President has spent $16.2 million and Hillary for America has spent $13.5 million. According to the Kantar Media report, guessing totals will be tricky until the Republican presidential primary is over. If GOP candidates wage a lengthy battle for the nomination, their spending will be isolated to specific battleground states, the report predicts. However, if a Republican candidate is decided relatively early, both parties will begin advertising on the national scale more aggressively, meaning the total spending would be much higher for the election cycle. "If Republican candidates run out the primary until June," Kantar quotes Scripps vp Michael O'Brien as saying, "we have lost the opportunity to max out revenue."